One of the pieces of gear that makes the biggest difference to the comfort or discomfort of travelling is without a doubt the bag one chooses. Making the wrong choice can virtually assure you of ending up with a sore back and chafed shoulders while carting one’s precious gear through airports and onto planes. Making the right choice, however, can result in a wholly different experience when navigating the world’s airports, hotels and transport. Factor in travelling for business and you quickly realise that dragging a beat up backpack on your travels just doesn’t cut it. 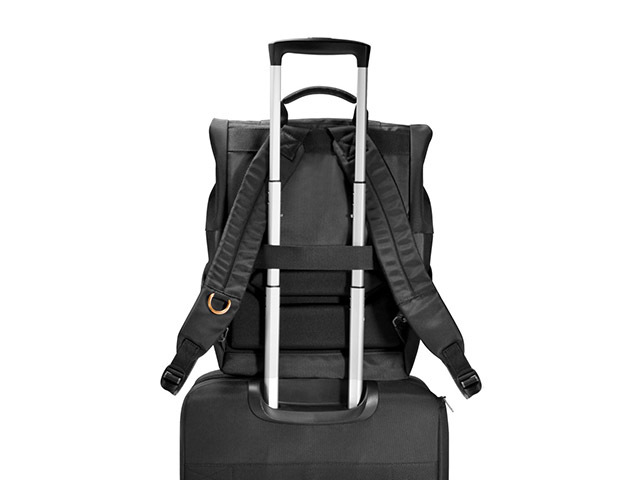 The Everki ContemPRO Roll top backpack is clearly intended to address both concerns, both looking smart while offering above average capacity and excellent comfort. To start with, the ContemPRO is actually quite conservative in appearance, robed in black and a smattering of grey, and certainly would not be out of place in a premium lounge or in business class. It also sports some thoughtful additions, namely a well padded handle on its top to quickly pick it up when you are on the move. 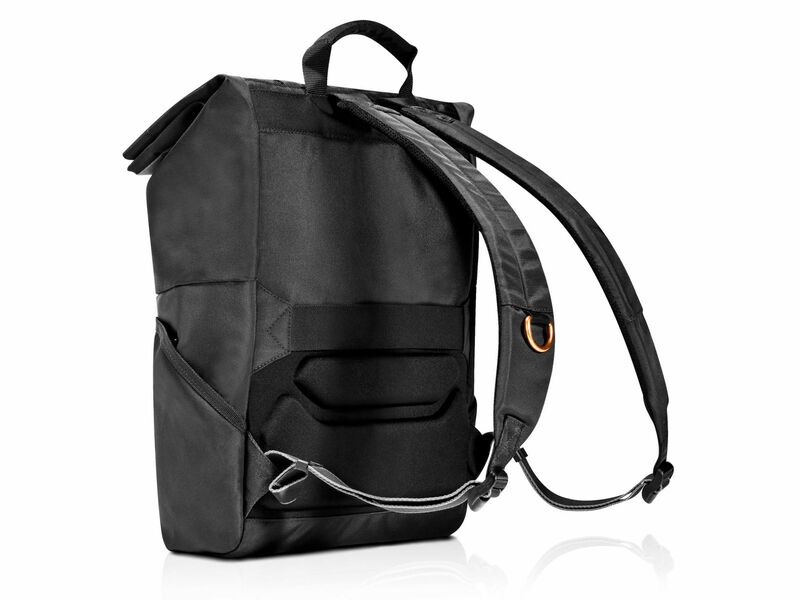 However, arguably one of the most important elements of any bag, especially those destined to be worn on your back for long periods, are the shoulder straps themselves. On this front, Everki really gets it right – they are fairly wide, and very well cushioned. The more heavily I loaded the bag, the more I appreciated the latter in particular, especially since the bag doesn’t have a belt clip or a means of fastening it across your chest. The former is often a mixed blessing – great to have to distribute weight onto one’s hips if you are inclined to use it, but also a nuisance, dangling down your legs if you are not. As for the latter, I would have liked to have seen Everki include another way to fasten the bag securely onto one’s body. This is not entirely a train smash though – the width of the bag is such that it sits quite squarely and evenly on the back, and thus doesn’t bounce around too much when walking fast. The lining on the back of the bag is similar to that on the shoulder straps – nice, thick, and spongy, which means I didn’t find any loose electronics digging into my spine. Its contoured air channels are also intended to mitigate against that horrible clamminess you would otherwise get when a backpack has been sitting on your back for extended periods. Comfort wise, the ContemPRO absolutely nails it, ticking all the boxes. 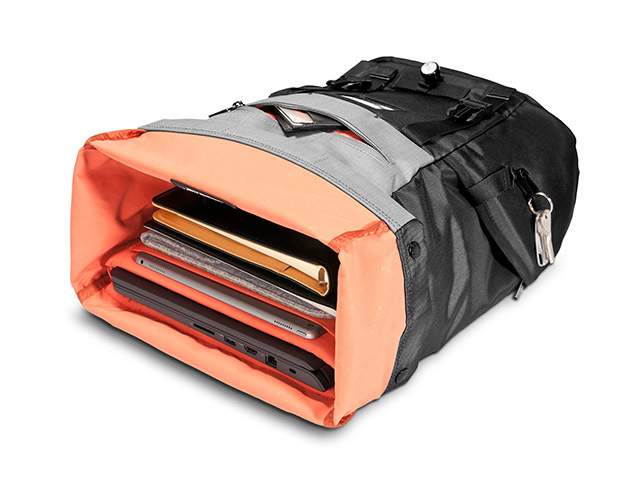 The next concern for any bag, of course, is how much can it hold, and how securely can it hold it? The answer is quite a lot, actually. Firstly, there is a nice, padded notebook compartment that could easily fit up to a 15.6” notebook, and a secondary, thinner compartment that no doubt is intended for up to a 12” tablet or paper notebook. There is another, smaller inner pocket, this one with a mesh covering, that can be used to house a smartphone, carkeys or travel documents. Beyond that, the rest of the internal compartment is open, rather than separated by dividers. This means that you can, like a top loading hiking backpack, cram a lot in there, depending on how adept you are at packing (rolling clothes, and strategic packing of small pouches, works wonders). Additionally, the interior of the bag is orange, which is apparently intended to make it a bit easier to distinguish and find your gear. On the exterior of the bag you get three additional, smaller compartments; one on each side and then a small front compartment as well. These can be used to hold your wallet, car keys or a waterbottle, for example. Although they are not very deep, they are sufficient for smaller items that you want to have in easy reach. The real trick that the ContemPRO has up its sleeve is that the main compartment isn’t secured by zips, but rather, magnetically. It can also be expanded, or, as the name suggested, its top can be rolled over to make the whole bag it a bit more compact. Where I can see the latter becoming particularly useful is when transitioning from doing international flights to domestic ones, where the overhead bins become notably smaller, or flights becoming particularly crowd and space even more precious. Finally, the bag has a trolley pass through on the bag, enabling you to slip it over your wheeled luggage, and a small window on the front, which you can either personalise with your name and address (I advise against the latter, at least when passing through O.R Tambo) or rather put your business card in it instead. If you are looking for a spacious, comfortable and smart looking bag to accompany you on your next business trip, this one is an easy recommendation. Helping matters is that the ContemPRO is quite reasonably priced too, coming in at R1 670.